Le petit déjeuner is delivered daily to this ultra-luxurious linked bell tent with distant views of the Pyrenees. Stretching across seven breathtaking acres of tranquil, wildflower meadow, fringed by enchanting oak woodlands, the views from this beautiful Haute-Garrone glamping site are breathtaking, with the peaks of the Pyrénées towering tantalisingly on the horizon. These spacious luxury bell tents (internal space of 45 m2) all have wooden decking, sun loungers, shaded canvas awnings and stunning views of the countryside. These beautifully decked out canvas retreats offer two bedroom linked Bell tents (6m and 5m linked) for up to 6 people. There is a superking bedroom off the 6m tent and another double bedroom off the 5m tent. Additional guests can stay in the lounge areas of either tent which link the two tents together. Bedding is of the highest quality with luxury cotton sheets, and netted inner tents come as standard. The lounge area or outdoor decking are both ideal spaces to stay up late chatting under the stars, whilst the kids are snuggled up in bed. La Vie en Rose is ELLE magazine recommended 'Top 5 Cool Camping in Europe' and TripAdvisor rated 'Excellent'. Every morning awake to a freshly prepared petit-déjeuner, delivered directly to your tent, including fresh fruit, breads, pain au chocolat and croissants. Each Bell tent has its own beautifully appointed private shower / toilet room facilities with organic soaps and toiletries and fluffy hotel towels included! Let's not forget the complimentary gifts upon arrival, which certainly add to the personal touch at La Vie en Rose. These wonderful tents also boast their very own outdoor wooden kitchen (15m2!) with gas hob, BBQ and fridge. Everything you need should be there, a basics box is provided (tea, coffee, sugar, salt, pepper, olive oil, balsamic vinegar, milk, butter etc) and a full range of cooking equipment. Enjoy breakfast with the sunrise and supper as the sun sets! The communal lounge area in the heart of the campsite has some comfy sofas awaiting you and an area to relax in the shade. Table tennis, pool table and a selection of board games and books are available for both little ones and grown ups, and it's a great place to meet and socialise with other guests. Wireless internet is available for free in this area should you need to stay in touch, complete with charging points to power up your electrical gadgets! The new heated salt water swimming pool with splash area is a perfect place to escape the summer heat, whilst the games area offering Petanque, Basketball, Volleyball, Swingball, Football, slide and swings will keep the children happy for hours on end! The new Outdoor Lounge area is a perfect place to sit on a comfy sofa, in the shade reading a book or having a glass of wine! La Vie en Rose is a family run site and welcomes your children. There are travel cots, sheets, blankets, high chairs, spare push chair, baby carrier, baby bath / change facilities, child safe utensils and activities to keep them occupied! Most of all, there is space for them to roam free, so the whole family can enjoy their holiday. The on site little shop has a small supply of wines, chilled beer & soft drinks as well as a tourist information area. The surrounding farms and markets boast a wealth of fantastic local produce and the owners Emma and Jamie will happily point you towards the finest regional charcuterie, meats and cheeses – the goats’ cheese, Chevrerie in Escanecrabe, is a must. Restaurant-wise, Auberge Champêtre (0033 561 88 22 71), in the village of Escanecrabe is excellent. Ten minutes away in Aurignac, Hôtel Sts Laurans (0033 561 90 49 55) brasserie and garden restaurant serves up refined dishes in sophisticated surroundings. Their wine list is also pretty extensive. And when it's time to venture forth, this pocket of southwestern France has a wealth of scenic and historical eye candy to sample. Head to the beach at Lac de la Gimone for a refreshing summer swim, or take your little lords and ladies to the fortified city of Carcassonne – a UNESCO World Heritage Site that hosts jousting, troubadours and medieval fairs. And of course, there's the Pyrénées calling all weekend Wigginses to test their cycling stamina on the Col du Tourmalet Col d’Aspin. Named after the signature tune of France’s national songstress, Edith Piaf, a stay at Camping La Vie en Rose really is a ‘Life in Rosy Hues’. Swinging lazily in the hammock, admiring this secluded patch of Pyrenean paradise, we reckon France's iconic diva would approve. At La Vie en Rose we decided it was time to offer the kind of family holiday we were looking for. La Vie en Rose is ELLE magazine recommended 'Top 5 Cool Camping in Europe' and TripAdvisor rated 'Excellent'. Combining all the best elements of the outdoor camping experience with the luxury of a boutique hotel. We offer a place for you and your family to create special memories. Situated in the Sava Valley of the beautiful Haute Garrone region of France - famous for its sunflower fields, outstanding views and unspoilt beauty. Discover breathtaking scenery, local markets, Chateaux, fortified villages, brocantes, vineyards and gastronomic culture, all in the sunshine and fresh air. Our spacious luxury bell tents (internal space of 45 m2) all have decking, shaded canvas awnings and views of the countryside. Our canvas retreats offer two bedroom tents (6m and 5m linked) one of which is superking (luxury cotton sheets and netted inner tents as standard) and a lounge so that you can stay up late chatting under the stars, whilst the kids are snuggled up in bed. Private luxury shower rooms and private wooden kitchens. All of this with a box of petit dejeuner delivered fresh to your tent each morning! La Vie en Rose offers a swimming pool, basketball pitch, volleyball, table tennis, pool table, pétanque, swing ball, football, slide & swings. Alternatively choose your own rhythm and have a lazy day in the shade on your private hammock whilst the kids explore the surrounding woodland. At night sit and marvel at the wonderful skyline and the myriad of stars. La Vie en Rose is a family run site and we welcome your children. We have cots, sheets and blankets, high chairs, spare push chair, baby carrier, baby bath / change facilities, child safe utensils and activities to keep them occupied! Most of all a space for them to roam free. We look forward to welcoming you to our little slice of France. For all of our photographs and reviews, please visit us on Facebook, Instagram or TripAdvisor! 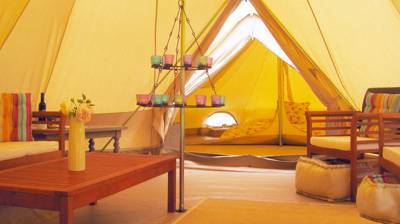 5 spacious bell tents with wooden flooring, separate lounge, decking, sun loungers and shaded canvas awnings. Each tent has its own fully-equipped outdoor kitchen with gas hob, BBQ and fridge, plus private shower/toilet room facilities with organic soaps and towels included. Swimming pool, outdoor lounge / Morrocan area (candlelit in evenings, perfect for glass of wine or shady reading area during the day). Free Wi-Fi and a washing machine. Groups, families – yes. Dogs, caravans, campervans – no. Head up the mountains for a spot of wild swimming. Day trips to Les Laquettes, Lac de Mondeley and Lacs de Bastan are a popular option. There’s car parking available and the latter boasts a café and beach. France's fourth largest city Toulouse is around an hour away. There's plenty of museums and exhibitions to see including the fine art collection at the Musée des Augustins (0033 561 22 21 82), while a visit to the Cité de l'Espace (0033 567 22 23 24) – the national space centre – is out of this world. A gentle river cruise along the city's Canal du Midi is a fantastically peaceful way to round of your day trip. Why not treat yourself to a day of pampering restorative Pyrenean baths at the Balnéa (0033 891 70 19 19) spa. The great thing about glamping in France is the food! A continental breakfast of fresh fruit, breads, pain au chocolat and croissants is delivered to your tent each morning, as well as complimentary welcome gifts upon arrival. The surrounding farms and markets boast a wealth of fantastic local produce and Emma will happily point you towards the finest regional charcuterie, meats and cheeses – the goats’ cheese, Cheverie in Escanecrabe, is a must. Restaurant-wise, Auberge Champêtre (0033 561 88 22 71)in the village of Escanecrabe is excellent. Ten minutes away in Aurignac, Hôtel St. Laurans (0033 561 90 49 55) brasserie and garden restaurant serves up refined dishes in sophisticated surroundings. Their wine list is also pretty extensive. Once in Escanecrabe (on the D36), go past the village church on the left and take the next left. Follow the signs to Camping La Vie en Rose from here.